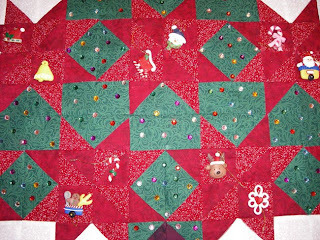 I finally finished gluing each of the colored rhinestones onto the Christmas Tree Quilt. It was a tedious process since those little items are hard to hold. I used Aileen's all purpose Tacky Glue. More than likely, the wall hanging will just get a dusting and spot cleaning when needed. How much is too much bling? On my own Christmas tree, I usually have tons of lights. I ended up using 150+ rhinestones for lights. They were the plastic kind and served their purposes for the inexpensive price. Here are the results, let me know what you think. Of course, It's hard to capture the sparkle but they shine just like lights. Click on the photo see closer up. Now, I've already decided that there is not enough room for the snowflake garland. The ornaments, I'm just not sure. I still want to tie them on with the silver twine and make bows. The twine will hold the ornaments and provide the "tie quilting" needed inside the tree. 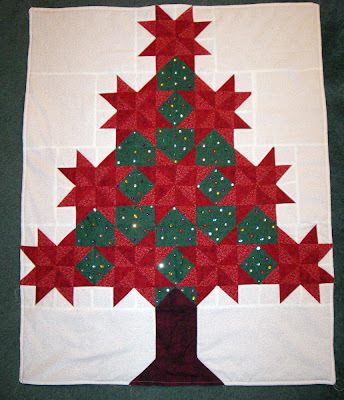 Right now I have only quilted around the outside of the tree. Here are two photos of the ornaments on the tree. I have not secured them just yet. Still debating. Maybe I'll go and complete a folded star ornament and think about it. I'm new to quilting and I really like the practical tips you have. I just some some quilted backing last weekend for a project I'm working on and I was so happy to avoid the whole "sandwich" process. 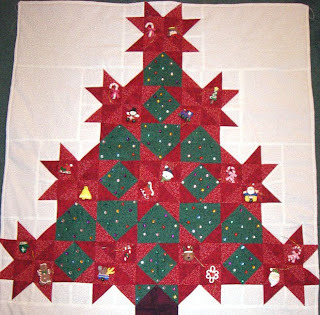 I really like this particular quilt design and I may give it a try after I get a little more experience.